PULLMAN, Wash. – More than 30 programs work to provide free books to people incarcerated around the country, improving literacy in prisons and bolstering poorly funded prison libraries. An exhibit opening this week in the Washington State University Terrell Library atrium explores the history and role of these programs. The exhibit is one of several events tied to this year’s WSU common reading book, “Just Mercy,” by Bryan Stevenson. He is executive director of the Equal Justice Initiative, which offers legal representation to indigent defendants and prisoners. Read more at http://CommonReading.wsu.edu. WSU Libraries and the Center for Civic Engagement will sponsor an exhibit-related book drive Oct. 5-16 to benefit inmates of Washington State Penitentiary. Collections bins will be located in Holland/Terrell Library, Owen Science and Engineering Library and the Student Recreation Center. 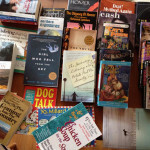 Gently used novels, chess books, dictionaries and GED test preparation books are frequently requested by inmates. Donors are asked to NOT include spiral-bound or hardback books, romance novels or books published before 1984 (binding glue used before that year becomes brittle, causing books to fall apart). For more information about the book drive, please contact Holly Luetkenhaus, WSU instruction librarian and exhibit organizer, at 509-335-4667 or holly.luetkenhaus@wsu.edu. 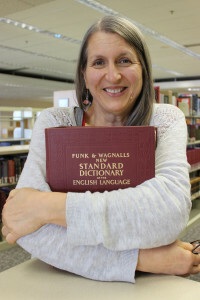 Luetkenhaus said she hopes those who stop by the exhibit will learn how books-to-prisons programs can transform not only individuals, but also the system of incarceration. “They are a good way for inmates to have access to reading material and education, which can reduce recidivism,” she said. Programs that send books to prisons operate independently, she said, taking letters from inmates who request books, locating materials and shipping them to penitentiaries at no cost. The programs rely heavily on volunteers and donations. One of the oldest programs in the country is in Seattle: Books to Prisoners (BTP), established in 1973 and sponsored by Left Bank Books on Pike Street, has three branches in Olympia and Bellingham, Wash., and Portland, Ore. 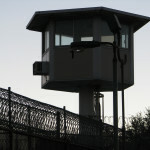 According to its website (http://www.bookstoprisoners.net/about/), BTP receives 1,000-1,300 requests each month from prisoners across the United States. Most requested are dictionaries, thesauruses, African American history and fiction, Native American studies, legal materials, GED materials and foreign language learning materials (particularly Spanish). Other common requests include genre fiction such as westerns and horror, vocational-technical manuals, politics, anthropology, art and drawing books (including blank notebooks) and books on paranormal phenomena. “Thank you for the time and effort you are taking reading these words from a man serving life without parole,” wrote T.D.S. from a Florida prison in 2011. “Books are treasures. Books take us on journeys out of time. 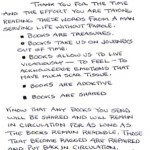 Books allow us to live vicariously—to feel—to acknowledge emotions that have much scar tissue. Books are addictive. Books are shared. WSU Libraries’ access services manager Sue Shipman knows more than most about the importance of books-to-prisons programs, though she’s not affiliated with any particular group. She has collected and given books to area correctional facilities on her own for the past five years. Many of the books were donated by fellow WSU Libraries’ employees or purchased after reselling books they donated. Shipman began her one-woman book drive while an acquaintance, a WSU student activist, was spending several months in the Whitman County Jail. She brought the student books to read on monthly visits, then shared more with other jail inmates. Eventually, she made book stops to the Latah and Nez Perce county jails in Idaho, Geiger and Airway Heights corrections centers in and near Spokane, Wash., and Coyote Ridge Corrections Center in Connell, Wash. She also plans to deliver books to the Washington State Penitentiary in Walla Walla. Shipman collects dictionaries, GED materials and other items for inmates to read: chess books; pregnancy and childbirth books; the classic, “Drawing on the Right Side of the Brain,” by Betty Edwards to give prisoners something to pass the time; books about dogs, especially “Old Yeller,” the 1956 children’s novel written by Fred Gipson; even a Peanuts comic book in Spanish.